The 1980s were an important decade for educational inquiry. It was the moment of the “linguistic turn,” with its emphasis on the role of language as a constructor of reality, a structuring agent for institutions such as schools, and a medium for translating knowledge into elements of power for processes of social regulation. 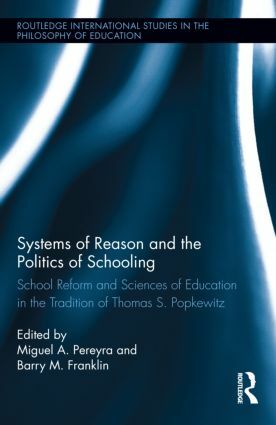 Drawing on the work and insights of educational researcher Thomas S. Popkewitz, this book shows how the linguistic turn provided an alternative to both mainline educational research grounded in the ideals of political liberalism and the effort of neo-Marxists to challenge liberal thinking in favor of a scholarship based on class conflict and economic determinism. Miguel Pereyra is Professor of Comparative Education at the University of Granada, Spain and a Past-President of CESE (Comparative Education Society in Europe). Trained both as an educationist and an historian, his research and publications are focuses on comparative & cultural history of education, educational reforms and educational policies. Among his most recent publications are: Cultural History and Education: Critical Essays on Knowledge and Schooling (2001, co-edited with Thomas S. Popkewitz and Barry Franklin), Changing Knowledge and Education. Communities, Mobilities and New Policies in Global Societies (2008), and PISA under Examination: Changing Knowledge, Changing Schools, and Changing Tests (2011, co-edited with Hans-Georg Kottoff and Robert Cowen). Barry Franklin is Professor Emeritus at Utah State University. During his ten years at Utah State University, he has served as a Professor of Education, Adjunct Professor of History, and Assistant Dean for Global Teacher Education. He writes widely on the history of the curriculum. His most recent book is Curriculum, Community, and Urban School Reform (2010).